Carbonization is one of the most widely used methods of friction and high-load metal parts performance characteristics improvement. This process involves diffusion saturation of low-carbon steel in controlled atmosphere with a mixture of carbon oxide and hydrogen (endogas) derived from natural gas and air mixture. Reactions of partial oxidation of hydrocarbon (including endogas production) proceed on solid nickel or platinum catalyst. Specialized cementation furnaces with premixed (CO:H2) atmosphere or furnaces with built-in endogas generator are used for carbonization. The challenge of low-carbon steel carbonization and endogas generation is the difference in process temperatures. Low-carbon steel (18ХГТ/HGT grade of alloy structure steel with 0.17-0.23% C, 0.17 – 0.37% Si, 0.8-1.1 Mn, up to 0.3% Ni, up to 0.035% S, up to 0.035 P, 1 – 1.3% Cr, 0.03 – 0.09 Ti and up to 0.3% Cu content) carbonization proceeds at temperatures of 850-950оС, while endogas generation occurs at 1020-1050оС. Carbonization velocity in most cases is 0,1mm/h with process time amounting to 8-12 hours. These conditions have a negative impact on overall carbonization process cost. From the chemical performance prospective, GIAP type catalysts currently in use allow to generate atmospheres with relatively high carbon residue content (2-3% vol. ), which leads to low process performance timing-wise and easy decomposability of microcrystalline state of carburized case. The goal of this research work was development of catalyst that would allow to lower endogas generation temperature and consequently generate atmosphere with low carbon residue content (not exceeding 1%). One more significant goal was stabilization of catalyst phase composition and minimization of solid-state transformations between catalyst components at high temperatures. Achievement of these goals would allow to reduce carbonization process time and improve its quality, as well as achieve process velocity amounting to 0,2-0,3 mm/h. γ-Al2O3 / Pt system was used as catalyst body to be applied on heat resistant high-porosity material with the following composition: Fe-Ni-Cr-Al. It was selected because it is well-characterized and easily accessible. Besides these catalysts are less toxic than their analogues with NiO active component. Other reasons why platinum was selected as catalyst of choice are as follows a) complex platinum compounds can be evenly distributed on the surface of aluminum oxide b) platinum crystallite size can be controlled c) partial oxidation reaction proceeds efficiently and selectively on platinum. Heat resistant Fe-Ni-Cr-Al alloy was selected not only because of its thermal stability, but its structural properties as well. 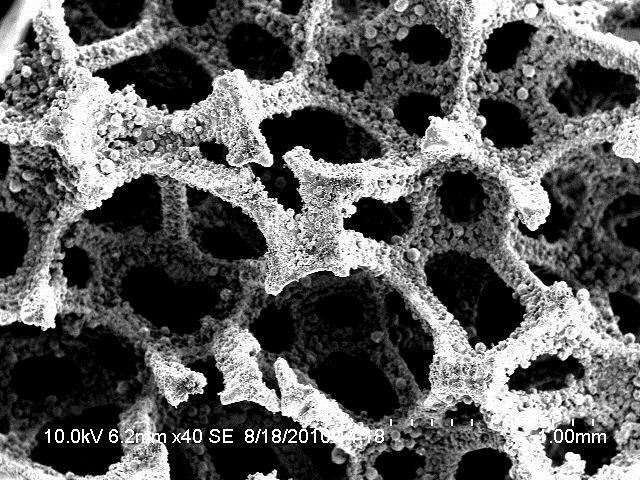 First, open cell high porosity (95-98%) structure gives an opportunity to blend gas-air mixture (hydrocarbon: air) homogeneously and completely. Secondly, catalyst microstructure allows to avoid local overheating that can be caused by high exothermicity of partial hydrocarbons oxidation reaction. Thirdly, high surface area creates maximum adhesion with γ-Al2O3/Pt system. γ-Al2O3 stabilization was performed at 85-950оС by means of doping 0,5% rare-earth oxide (either La or Pr or Nd). X-ray phase and BET-method analysis demonstrated that atoms of rare-earth element embedded into γ-Al2O3 crystalline grid stabilize its phase and prevent phase transistions γ-Al2O3 / δ- Al2O3 / θ- Al2O3 / α- Al2O3. Surface area of γ-Al2O3 doped with rare-earth oxide and heat treated at 950оС amounted to 90-105m2/g. Catalyst was manufactured in 2 stages. In the first stage catalyst substrate Fe-Ni-Cr-Al was impregnated with γ-Al2O3 / La2O3 suspension and then heat treated at 1000оС. In the second stage, the catalyst was impregnated with platinum complex compound solution followed up by deliquification and heat treatment under hydrogen at 950оС. Pulsed chemisorption method of СО was used to establish that platinum content on the surface amounts to 65-77%. Size of 87% of platinum particles falls within 2 to 11 nm range. Catalyst samples 34 mm in diameter and 32 mm in height were manufactured for test purposes. Endogas was generated by means of passing 35 litres/hour of propane/butane mixture and 400 litres/hour of air through synthetized heterogeneous catalysts at 930оС. Content of generated gas mixture was as follows: СО 23,84%vol. ; СО2 0,09%vol. ; СН 0,88%vol. ; Н2 30,63%vol. The catalyst recovered after tests did not change its dimensions and did not have any soot on the surface. 18ХГТ/HGT grade alloy structure steel sample was carbonized at 920оС under generated endogas for 4 hours after temperature equalization. Then the sample was cooled down to room temperature, after that heating for hardening at 830-840оС was performed followed by temper hardening in base oil E120A/И20А at 200оС for 2 hours. Test results demonstrated that carburized case thickness amounted to 1,2 mm, thickness of efficient layer with thickness exceeding 500HV0,1 amounted to 0,7 mm. End result – steel carbonization process is high velocity, easy to control and is characterized by high quality of microstructure.